By 1968, the sect’s magazine, Awake!, was proclaiming a new date for Armageddon: “Today we have the evidence required, all of it. And it is overwhelming! All the many, many parts of the great sign of the ‘last days’ are here, together with verifying Bible chronology.” That complex chronology ran like this: Adam was created in the autumn of 4026 B.C., which meant that 6,000 years of human existence would end in late 1975. The 6,000 years would be followed by the Millennium, 1,000 years of “Sabbathlike rest,” just as God rested after six days of Creation and established the Sabbath. Asked about 1975, Franz now says that the 6,000-year chronology is correct, but the seventh day of Creation did not begin until Eve was created. Thus the date for the End has to be extended by the amount of time between the advent of Adam and of Eve—an interval not yet revealed (previous Witness publications had stated that Adam and Eve were created in the same year). Even if we weren’t making plans for our own future, the Watchtower Society was thoroughly busy with its own plans. In early 1975 the Watchtower Society bought the Towers Hotel at 25 Clark St., which about doubled the living space for the Bethel family. 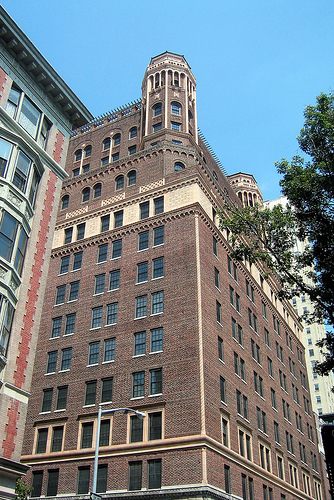 A massive remodeling of the Towers building was begun that year with volunteer Witness labor and it was connected to the other Watchtower residence buildings on Columbia Heights via a tunnel under 86 Willow St. There were several non-Witness tenants who had been living in the Towers on a long-term basis who found themselves pressured to move out of the building to make way for future Bethelites who would come to help publish warnings about a near Armageddon and the upcoming Millennium. Their sad story is documented in Barbara Grizzuti Harrison’s Visions of Glory: A History and a Memory of Jehovah’s Witnesses, pp. 136-138. There had been, of course, some cautionary statements in Watchtower publications about the year 1975. Those were well known. About 1974, some specific back-pedaling about 1975 began. I took part in a District Convention presentation in 1974 in Pullman, Washington which cautioned Witnesses not to be dogmatic about 1975. But, those of us who took the religion seriously had no doubts regarding the essential concepts of the 6,000 year chronology. Not one of my friends believed we’d be here in 2010, looking back 35 years and this old world still rockin’. Another speaker, F. W. Franz, the Society’s vice- president, forcefully impressed on the audience the urgency of the Christian preaching work. He stressed that, according to dependable Bible chronology, 6,000 years of human history will end this coming September according to the lunar calendar. This coincides with a time when “the human species [is] about to starve itself to death,” as well as its being faced with poisoning by pollution and destruction by nuclear weapons. Franz added: “There’s no basis for believing that mankind, faced with what it now faces, can exist for the seventh thousand-year period” under the present system of things. The Jehovah’s Witnesses, according to the Los Angeles Times, once again last week postponed the end of the world. The stock market promptly plummeted 17 points….Reports were vigorously denied that the postponement had been caused by pressure from the television networks, who feared the event would conflict with Monday Night Football….Unfortunately, the Jehovah’s Witnesses have not publicly rescheduled the event. But the trial run has served to prepare the nation’s media. Later, as September 5, 1975 passed by unnoticed by the world, newspapers carried articles from news services such as “End of the World Delayed Again” , published September 21, 1975 in the Boca Raton News. Of what significance is this today? It means that by the fall of 1963 mankind has dwelt upon this earth 5,988 years. Does this mean, then, that by 1963 we had progressed 5,988 years into the ‘day’ on which Jehovah ‘has been resting from all his work’? (Gen. 2:3) No, for the creation of Adam does not correspond with the beginning of Jehovah’s rest day. Following Adam’s creation, and still within the sixth creative day, Jehovah appears to have been forming further animal and bird creations. Also, he had Adam name the animals, which would take some time, and he proceeded to create Eve. (Gen. 2:18-22; see also NW, 1953 Ed., footnote on Vs. 19) Whatever time elapsed between Adam’s creation and the end of the ‘sixth day’ must be subtracted from the 5,988 years in order to give the actual length of time from the beginning of the ‘seventh day’ until now. It does no good to use Bible chronology for speculating on dates that are still future in the stream of time. Dropping uncertainties about biblical chronology and proclaiming 1975 as the end of 6,000 years of God’s “rest day” to be soon followed by the Millennium had helped to generate a tangible excitement about the nearness of Armageddon and had nearly doubled the number of Witnesses. Record numbers were being baptized and we were working day and night at the factory in Brooklyn to supply Witness evangelists with literature to distribute door-to-door. We were riding an emotional high of excitement full of confidence in our prophetic expectations. However, as the 6,000 year chronology became questionable, things began to unravel. I suppressed my dismay that we’d gone from an uncertainty about the significance of the 6,000 year chronology (the 1955 and 1963 statements) to certainty (the 1975 predictions based on Adam and Eve being created in the same year), back to uncertainty (the recycled ‘we don’t know when Eve was created, so our chronology is not exact’). As the year 1975 progressed with no End in sight, suppressed doubts began to surface among many other Witnesses also. Was the End really so imminent? Many of us had said that the exact timing of the End was not important. We had dedicated our lives to Jehovah and we would continue in His Organization regardless. Still, we had made life choices based upon the Watchtower Society’s 1975 chronology. Some of us had passed up higher education. Others had missed business opportunities or used up assets because “the time left was short.” Some Witnesses had deferred marriage or having children. We clung to the idea that our chronology was only off due to the uncertainty between the timing of Adam and Eve’s creation. Maybe Armageddon would come next year. But, several of us Bethel brothers realized also that if the End was decades or more away, we would need to consider how to support a family after our four year Bethel commitment was over. Living in the present world became a reality that had to be faced. Without specialized training or education after high school would many of us be left with low-paying, menial-type jobs? 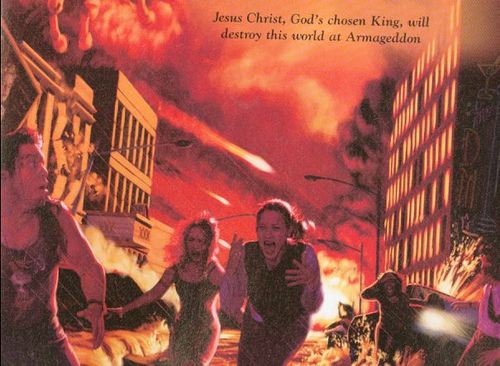 M. James Penton’s Apocalypse Delayed: The Story of Jehovah’s Witnesses, pp. 91-101, esp. note 11 on p. 357. This entry was posted on Friday, April 23rd, 2010 at 9:05 pm and is filed under Uncategorized. You can follow any responses to this entry through the RSS 2.0 feed. You can leave a response, or trackback from your own site. Thanks again for the material. I have a JW friend, so your story is very encouraging. I am anticipating the next installment of this article, just curious when it will be posted? It is great to see that those who have left the JW’s have the courage (against shunning) to speak out and reveal the truth. Thanks, Gareth, for the kind words. I hope to get the next installment up in the next couple of weeks. I studied a couple of times with the Witnesses always loved the people, but just couldn’t swallow the faith hook, line, and sinker. Can’t say I have ever had better friends though. Yes. I had some memorable friendships amongst the Witnesses also. I am a former JW. Born and raised. My father was an elder was a missionairy. I have been disfellowshipped twice (long story). My life as a JW is very misunderstood by my new family as it is hard to understand if you’ve never been a part of it. I have been disfellowshipped for 15 years now and would like to be a part of a support group that helps people extricate themselves from “the truth” as I know how hard that is and have, I think, some valuable insights. Do any of you have any connections or thoughts on how I might start this? Yes there are different groups that meet around the country/world… you can go to “meetup.com” to find them. Would love to talk to you. We were at Bethel the same time. Interesting journey! I”m particularly interested in the Eastern Catholic portion. I assume that only one installment of the journey has been linked to the subsequent installment. Makes it difficult to locate them. I’m hoping to continue with more installment of the series soon. Thanks for stopping by! Thank you so much for posting your articles. I was recently considering becoming a JW and have been trying to do more research on the religion. I have a friend and neighbors who are and I can agree with everyone saying they are really nice people. Please continue to post as much information as you have as I am desperately trying to understand better and make the right decision for me and my family. Friends and family members are having issues with me deciding not to celebrate holidays now. I want to make sure that I am receiving accurate information. Thanks for visiting the blog. I plan on posting an article on the subject of holidays in a couple of days. When I do, I’d love to hear any input you would have on the subject. Excellent series… you are my age! So, I read this with keen interest. The 1975 fiasco is so disturbing to me [and I’m sure many others, JW’s and non-JW’s alike]. Thanks for your writings, they were very insightful. I was pleasantly surprised to find another former Jehovah’s Witness enter into the true faith. I was a Jehovah’s Witness until I was 42 years old. I am now just 46 and I have been baptised into the Orthodox Faith. I am in the Antiochian Jurisdiction in northern Idaho. It’s great to here your story and I can’t wait to read the rest. It would be nice to start a network perhaps to help others that want to make the journey. I especially like how you started the story by saying it is God that guides us. I give God credit for taking me into the Orthodox church as well. Thank you once again. This was encouraging. The teaching that adam and Eve were created in the same year I believ was also in Aid to Bible Understanding, the big Bblue volume.